Join Rich Harrington, Rosh Sillars and me for a another great Mind Your Own Business webcast on Monday, October 27. Just click on the banner above for all the information on how to join us. Rosh Sillars is a veteran photographer with a photojournalism background specializing in people, food and interiors. He earned his BFA in photography at the College of Creative Studies (CCS), Detroit. Rosh offers his services to traditional media, new media and corporate clients. He owns the creative representation firm The Rosh Group, Inc. and teaches photography at two universities and serves as director of marketing and social media for Synectics media. Yesterday's hang-out was number six in the series with Photofocus. As usual with anything Michele Celentano does, she never disappoints. In this new episode she talks a lot about the importance of printed images and controlling the process to make sure her clients always get the very best of her work. She never compromises on quality, especially with finished images. It's a great conversation and in the process we even came up with a new tool to make the point about framed printed photographs. You can check out more about Michele on her site, blog and educational page, Michele Celentano Learning Group on Facebook. She's also an administrator in the new GoingPro forum for photographers just starting out or seasoned pros dealing with new challenges. You'll never be disappointed. As always, a big thanks tomy co-host, Rich Harrington, Photofocus and to this month's guest, Michele Celentano. Mind Your Own Business - Business Mgt Software, Kumu and Kevin Kubota! It's episode number five with special guest, Kevin Kubota. Most of you know Kevin as a software developer through Kubota Image Tools, but he's also one of the finest professional photographers in the world. With his new software, Kumu, he's taken all those challenges over the years in running his own business to a level of support that every photographer can now utilize. While we did talk about Kumu in this podcast, most of the time we were picking Kevin's brain on the routine he's developed over the years to simply manage his business. 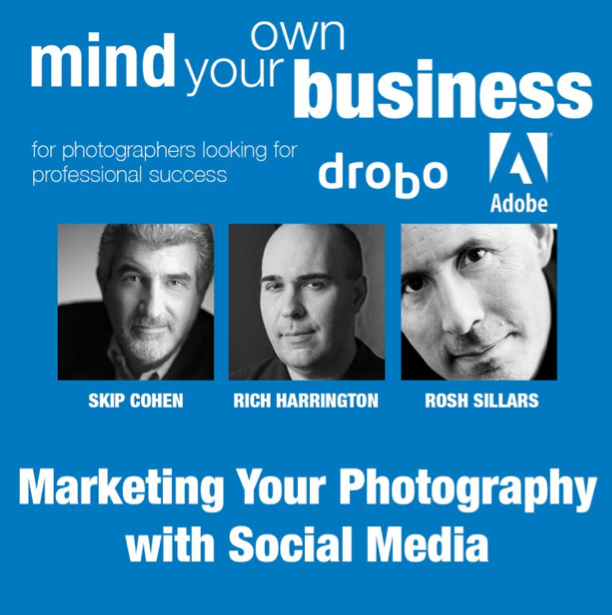 It's a terrific webcast with a lot of great information to help you get more organized and efficient in running a photography business. As always, a big thanks to my co-host, Rich Harrington and to this month's guest, Kevin Kubota! This is our fourth episode in the "Mind Your Own Business" series. Each one has hit on one particular topic to help you build a stronger skill set and in turn nurture your creativity and expand your horizons. In this new episode with Matthew Jordan Smith, we talked about the importance of special projects to help keep you focused on the passion that brought you into the industry in the first place. While not every project you do will always become a book project or gallery opening, Matthew talks about his newest "baby", Future American President. To read more about the project just click on this link. Here's an exciting opportunity to actually feature your child on the cover of the book. As always, a big thanks to my co-host, Rich Harrington and to this month's guest, Matthew Jordan Smith! It's our third "Mind Your Own Business" hangout and a BIG thanks to so many people who helped us get the word out. It's a great discussion about the key milestones in building your business and things you need to do to grow. A big thanks to my co-host, Rich Harrington and our special guest, Sandy Puc. It's our second "Mind Your Own Business" hangout and a BIG thanks to so many people who helped us get the word out, especially the ShutterFest Family! A big thanks to my co-host, Rich Harrington and our special guest, Sal Cincotta. A BIG thanks to so many people who helped us get the word out for the first "Mind Your Own Business" hangout. Lots of great questions and more hangouts to come. If you missed it, each hangout will be on YouTube, giving you a chance to catch up and still get the benefit of the broadcast. The video from this first episode is below. A big thanks to my co-host, Rich Harrington and our special guest, Tamara Lackey!